Holiday parties are definitely a time for cocktail consumption, but unfortunately, those tasty drinks can rack up the calories and Weight Watchers Points pretty fast. But with this super tasty and minty fresh Weight Watchers Cocktail Recipe, you don’t have to avoid the festive holiday drinks that you love so much! This Peppermint Martini is such a great holiday drink to serve at your Christmas party this year – it tastes so fresh and winter-y and is only 3 Points, so you can indulge with minimal guilt. Just one word of caution, these peppermintinis are pretty potent and one too many may make you throw caution to the wind and start downing everything in sight, so play it safe and stick to just one or two. This delicious Peppermint Martini Recipe is sure to be a hit at your holiday bash! Combine the vodka, peppermint extract, fat free creamer, splenda and ice in a cocktail shaker. Shake it like Santa knows you’ve been bad. 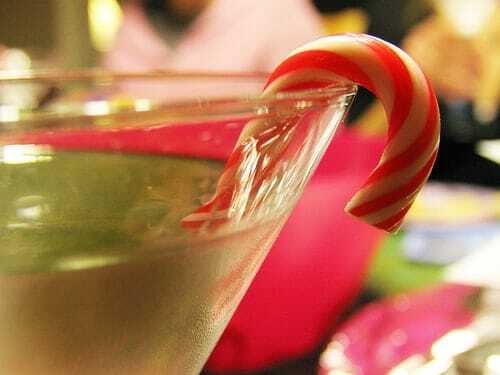 Carefully strain the mix into the martini glass and garnish with the candy cane, or peppermint stick. Ho ho ho and away we go! Enjoy! this was soooo goood! and I used voli vodka which kept my points down on weight watchers :)!! I would def suggest it!